In a medium sized bowl mix together flour, oats, sugar, baking powder, cinnamon, and salt. Once combined stir in egg, vanilla, apple juice, and chopped apples. Stir until lumps are mostly gone. Heat a frying pan over medium-low heat and spray with PAM. Pour 1/4 cups of batter onto warm frying pan and cook until pancake appears bubbly. Flip pancakes and cook until browned. 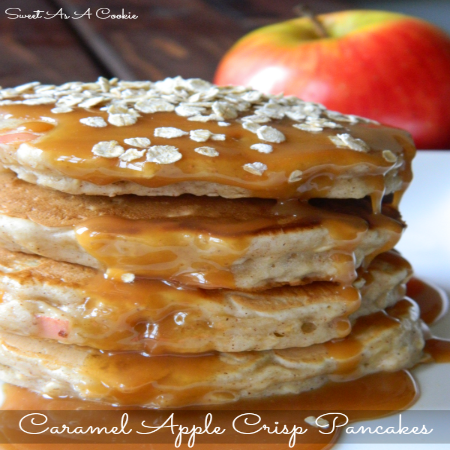 Serve with a generous amount of caramel sauce and enjoy!